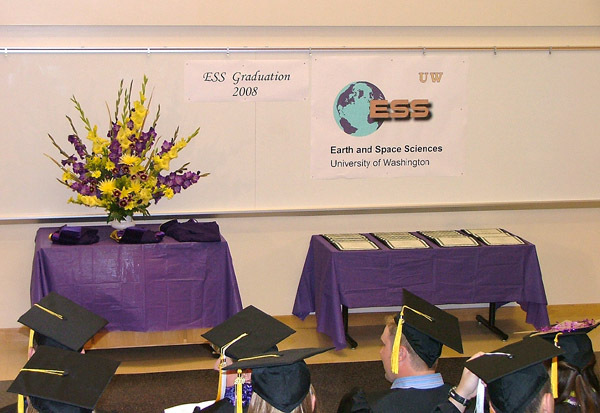 On Saturday June 14th 2008, the UW Dept of Earth and Space Sciences held its annual Graduation Ceremony, celebrating the accomplishments of 22 undergraduate students and 3 graduate students. This ceremony was hosted by ESS Chair Robert Winglee, and assisted by Ed Waddington, Jody Bourgeois, and Darrel Cowan. 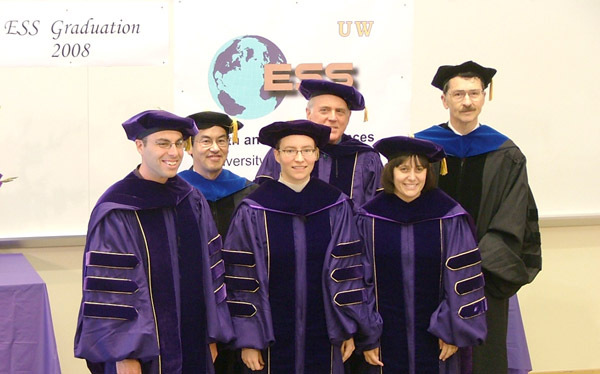 A Slideshow of photos from the ceremony, with individual student pictures, has been created. As a special final (free!) service for our graduating students, the ESS department recorded a video of the ceremony and shot still photographs of each student receiving their diploma. The photographs can be viewed online via a web slidshow, and/or each photograph can be downloaded in its full 12 Mpixel resolution for high quality printing. Use the "Orig-Pic" link at the top of each slideshow page to download and save the original fullsize photo (about 5 MB jpeg each).